This weekend was spent in Terri Myers Wentzka‘s studio paying attention to drawing and developing a composition for a future watercolor. It was a wonderful weekend with lots of personal attention and learning along side the other participants. Terri paints beautifully and her drawings are awesome. 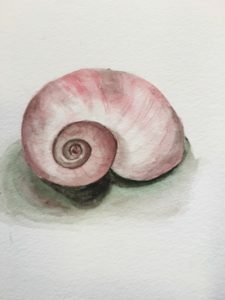 During the Friday through Sunday workshop Terri took all of us through a short bootcamp for drawing and then led us through the process of developing a composition for a watercolor painting. I am always humbled by the hard work of preliminary planning and the process that takes place before the palette is taken out and the brush hits the paint. The weekend reminded me how many shortcuts I take in the process…and should not! The workshop began with a number of warm-ups. Drawing with the non-dominate hand, drawing observed values on the surface of an egg, bones, and many other drawing techniques in-between. The next step in the process was to select three objects and draw them into a number of compositional thumbnails and develop one of the thumbnails into a more completed value drawing. The objects that I selected were a model of a crow, a branch and a shell. 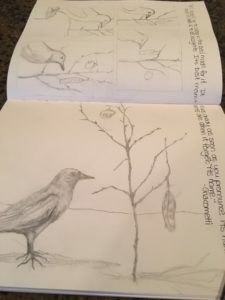 The thumbnails were varied but I was curious about one composition and decided to develop it with more observational drawings in my sketchbook. 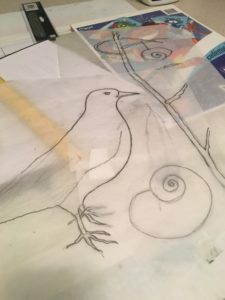 Terri then had us draw each object onto tracing paper. More play with overlapping and shifting the elements with more experimenting with possibilities. The process was starting to focus my intent and the “story” that I wanted to build into the painting. My final step was to create a value painting. Although the value study for the composition had many possibilities I saw even more. 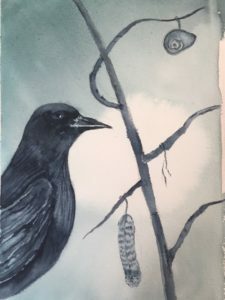 My final painting will have adjustments to the size of objects, color, values and the position of the crow. A lot of work on process this week-end and a great reminder how important the creation process is to painting. The weekend was devoted to imagining/generating, planning/preparing, incubating/focusing/, developing/making, refining, and evaluating/revising. It was a weekend that re-emphasized what is so basic and yet easily overlooked. We often have an eagerness to just jump in and hope it turns out. Creative process adds a deeper level of confidence and is open to play and experimentation. Good lessons learned this weekend! Having just spent a week-end at our lake place near Alexandria, Minnesota I was struck by the beauty of the colors that just popped into peak fall color. Why does after 60+ years of noticing fall colors I am still in awe of what nature delivers to us this time of year? Spectacular once again! 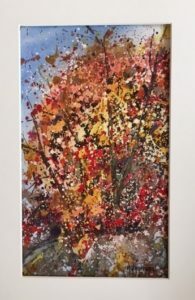 A couple of weeks ago I painting this impression of fall colors and I think the thoughts of Mary Oliver in her poem, “Fall Song” is where I want to leave this week’s thoughts. Enjoy the landscape and soak in the color. 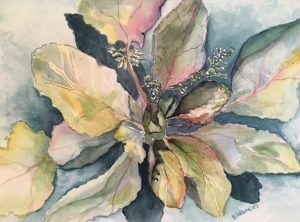 Artscape Studio and Gallery (Kathy Grundei) and Three Havens Studio and Gallery (Linda Gaugert) will be on the Alexandria Crafters and Artists Studio Tour. Seeing the world one drawing at a time. I love the work of Maira Kalman. I love the ideas of Maira Kalman such as “I walk everywhere in the city. Any city. You see everything you need to see for a lifetime. Every emotion. Every condition. Every fashion. Every glory.” She sees the world as she walks. Maira records the moments most people don’t even notice and makes them beautiful. The power of walking is a force of intellect, awareness and creativity to Kalman. Her illustrations are delightful impressions of what she notices as she walks the neighborhoods of New York. Artists like Kalman have long known there are two ways of seeing the world, seeing and noting objects as a nonartist or seeing the world as an artist by taking note of the colors, light, shapes, negative space. Kalman uses her vision to show us her world one drawing at a time. Her illustrations for The New Yorker, children’s books and books for the young at heart are imaginative, witty and so honest. Kalman’s need for walking and movement as a gateway to a higher sensibility is something a number of great creators have in common. According to writer and blogger Maria Popova, Dickens and Hugo were avid walkers during times of creative thinking; Twain paced madly while dictating, Goethe composed on horseback; Mozart preferred the back of a carriage. Maybe there is something powerful about walking (or movement) leading to being present. In walking is there an effect that opens us up to observation? Do our minds flow into inner dialogue about what is in our field of vision, not realizing that ideas are beginning to take root. mountains or through war torn lands. Just a nice stroll through hill and dale. But now I walk everywhere in the city. need to see for a life time. old people who have difficulty walking. Maira Kalman is the perfect example of “drawing attention to life.” What an inspiration! Check out her blog at kalman.blog.nytimes.com After doing that, go for a walk in your neighborhood and we might just pass each other! I love when I stumble upon something I had never heard about. My latest “stumble upon” came from a blog I was reading that mentioned “Oblique Strategies.” The other amazing thing was that I was reading this blog in a creative “dry period” that I have been experiencing since the studio open house from a couple weeks ago. Always amazing how things come to you when you need it. 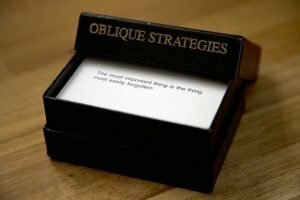 Oblique Strategies originally was created in 1975 by musician Brian Eno and painter Peter Schmidt, The strategies began as a box of index-sized cards for artists, made of cut up, discarded prints from Schmidt’s studio. Each card contains a (sometimes cryptic) remark that can help resolve a creative dilemma. Make a sudden, destructive unpredictable action; incorporate. From nothing to more nothing. Remove specifics and revert to ambiguities. Simply a matter of work. I think I will decorate, decorate this weekend. Lets hope that it takes me out of my malaise for painting! Check out the card deck or the app for your phone. Maybe the advice is not only about art blocks but life blocks as well!